When the original data changes, you can refresh the extract using Desktop by selecting a data source on the Data menu and then selecting Extract > Refresh. Extracts can be configured to be fully refreshed, replacing all of the data with what’s in the original data source, or incrementally refreshed, adding just the new rows since the previous refresh. Note: You can also automate extract refreshes using the Tableau Data Extract Command Line Utility. For more information, see Tableau Data Extract Command-Line Utility. If you want to refresh an extract, make note of the file format of the extract before you perform an extract refresh. If you perform a refresh on an .tde extract using version 2019.1, the extract is upgraded to .hyper extract automatically. While there are many benefits of upgrading to a .hyper extract, you will be unable to open the extract with previous versions of Tableau Desktop. For more information, see Extract Upgrade to .hyper Format. By default, extracts are configured to fully refresh. This means that every time you refresh the extract, all of the rows are replaced with the data in the original data source. While this kind of refresh ensures that you have an exact copy of what is in the original data, depending on the size of the extract, a full refresh can sometimes take a long time and be expensive on the database. If an extract is not configured for an incremental refresh, selecting to refresh the extract will perform a full refresh of the extract. 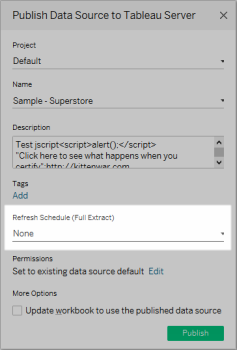 If you plan to publish the extract as a data source to Tableau Server, you can specify a schedule for the extract refresh during publishing. Similarly, if you are publishing the extract in a workbook to Tableau Server, you can also specify a schedule for the extract refresh during publishing. For more information, see Schedule Extract Refreshes as You Publish a Workbook. If you plan to publish the extract as a data source to Tableau Online, your options for refreshing your data depend on the characteristics of your data sources. For more information on refreshing data from specific data sources, see Extract refresh options by data source. Rather than refreshing the entire extract, you can configure a refresh to add only the rows that are new since the previous time you extracted the data. For example, you may have a data source that is updated daily with new sales transactions. Rather than rebuild the entire extract each day, you can just add the new transactions that occurred that day. Then once a week you might want to do a full refresh just to be sure you have the most up to date data. Note: Most data sources support an incremental refresh. You can follow the steps below to set up an extract to be refreshed incrementally. Select a data source on the Data menu and then select Extract Data. In the Extract Data dialog box, select All rows as the number of Rows to extract. Incremental refresh can only be defined when you are extracting all rows in the database. You cannot increment a sample extract. Select Incremental refresh and then specify a column in the database that will be used to identify new rows. For example, if you select a Date field, refreshing will add all rows whose date is after that last time you refreshed. Alternatively, you can use an ID column that increases as rows are added to the database. Note: The data engine, which is the underlying mechanism that Tableau uses to create extracts, stores time values with a precision of up to 3 decimal places. If you specify a datetime or timestamp column for Identify new rows using column, and your database uses a higher precision than Tableau, you can end up with duplicate rows after an incremental refresh. For example, if the database has two rows, one with a datetime value of 2015-03-13 17:30:56.502352 and one with a datetime value of 2015-03-13 17:30:56.502852, Tableau will store both rows using a datetime value of 2015-03-13 17:30:56.502 thereby creating duplicate rows. The steps above can be used to define a new extract or edit an existing extract for an incremental refresh. If you are editing an existing extract, the last refresh is shown so you can be sure you are updating the extract with the correct data. You can see a history of when the extract was refreshed by selecting a data source on the Data menu and then select Extract > History. The Extract History dialog box shows the date and time for each refresh, whether it was full or incremental, and the number of rows that were added. If the refresh was from a file, it also shows the source file name.